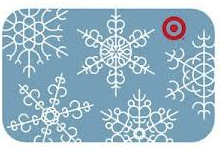 Monday Giveaway: Target gift card! This giveaway is closed! Congrats to Claire M. for winning! We here at O’Mamas are going to be giving away gift cards each week for the next six weeks. This week we are starting with one $20 gift-card to one of everyone’s favorite places… Target! Maybe you need some new leggings. Maybe you will re-gift it. Maybe you need some groceries. Maybe you know someone else who needs groceries. Maybe you are like me and just like to walk around aimlessly and see what ends up in your basket? To enter: Leave a comment here telling us your Target weakness. They are manually approved, so it might not pop up right away. Then scroll to the bottom of the post (above the comment section) and share this post via Facebook or Twitter. Prize ships in the USA only…. but don’t worry… a few of the gift cards in the coming weeks will be sent via email so those will be open to residents in other countries too! Nitty gritty: Only one entry per person per day. Giveaway starts right now and ends Wednesday, November 14, at 10PM PST. Winner will be chose randomly and announced Thursday here on the blog! Good luck! And don’t forget to check back the next six Mondays… the gift cards will be getting bigger and better… Whole Foods anyone? Clearance end caps 🙂 oooh and the dollar aisles at the front of the store! The clearance end caps are my weakness and I see Maria follows that weakness! Way to go Abby and Jeanne! Great Blog! Target’s brightly colored, fluffy towels and affordable bath accessories allow me to recorate my bathroom for each season and holiday! Mood lifts need not be costly. I lose myself in the candle aisle. I don’t care how many I already have, I normally walk out with another. My current favorite is maternity clothes!! Comfy!! Also kids arts and crafts. Just bought a 24 pack of playdoh_! I cant leave any store that has books without one……so ill be in the book section! Um, everything?!? Kid’s clothes especially! So.darn.cute. Not sure that my reply went through the first time…So I’ll repeat myself! I always get kids clothes at Target. Cheap and Cute. Also I almost always buy some soda and chips ( I know, I know not healthy, but it’s what he likes) for the sweetest homeless man who panhandles on the street outside of target. they always have cute flats! Like i need more shoes! I love the skinny mirror in the belt section of my Target, it makes me feel so good. I love everything about Target and yes I could use some new leggings. ummmmm…..baby clothes, shoes, workout clothes, socks, music, holiday/special occassion items, hair care, cards, gift wrapping supplies, ,,,,,uuummmmm…..so much more!! LOVE TARGET! !